Why you should chose Authentic Cuba Travel for your next Cuba cultural tour? I'm an American, can I travel to Cuba legally? What is the General License application about? What documentation should I put together? What kind of trips to Cuba can I join as an education professional? Can I take my students to Cuba from USA? Can you help? Yes, we can! We have put together a blog that attempts to explain in easy terms the complex issues surrounding USA Cuba travel. Follow us! Sign up for email updates from Authentic Cuba Travel. Our Newsletters are full of information for art teachers, art curators, photographers, artists, performing arts & theatre professionals, dancers and those travellers interested in Cuban culture & arts. Last minute discounts on Cuba cultural tours, contests and featured cultural travel opportunities. All to keep you up to date with the cultural world of Authentic Cuba Travel. Jo Jazz Festival of Havana The Jo Jazz Havana is the result of music education in Cuba. As talented young jazz musicians emerged from Cuban music schools every year, they are eager to showcase their talents in Havana’s most popular jazz venues. Cuba Festival of New Latin American Cinema. The Havana Film Festival is a cultural event with no parallel for the promotion of Spanish language filmmakers. It draws thousands of movie goers and cultural buffs from all over Cuba each December. Authentic Cuba cultural travel goes to Havana for the 35th Jazz Festival of Havana 2020 organized by renowned Cuban jazz musician Chucho Valdes will run January 14-19, 2020 at several locations in Havana. 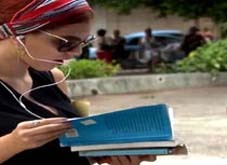 Travel to the festival with the highest attendance in Cuba: the 29th Havana International Book Fair 2020 that will begin in Havana City on February 2020, and then it will spread east and west of the capital. The book fair will end in Santiago de Cuba. The Habano Cigar Festival 2020 is considered by experts as the biggest world party to promote the Premium type cigar. It only competes with this one, without surpassing its quality, the Big Smoke of Las Vegas in the United States. Travel to Santiago de Cuba for the Fiesta del Fuego Festival 2020 (Fire Festival 2020) that highlights the cultural expressions of the region. The annual Fire Festival is a very well-known street party taking place in the month of July in the city of Santiago de Cuba. International Ballet Festival of Havana 2020. Organized by the Cuba’s National Ballet, the International Ballet Festival of Havana draws dancers, choreographers and companies from all over the globe. The Havana Art Biennial 2021 is an exciting celebration featuring not only the best of Cuban visual artists, but also artists from other countries from Latin America, the Caribbean, and from developing countries. Authentic Cuba Travel operates under the auspices of Cuba’s premier cultural institutions and organizations. As a participant in our cultural tours you will be granted access to Cuba’s premier art galleries, museums, and art foundations. If you choose a Cuba festival tour, you will have official status and will be provided with “all access” pass that will grant you access to all official festival exhibits, concerts, presentations and venues. You will enjoy back stage tours, stay in official festival hotels and rub shoulders with prestigious Cuban and international musicians, exhibitors, speakers, publishers, personalities and more. Authentic Cuba Travel offers the largest selection of educational and cultural Cuba tours available. No other company offers the wide scope and quality of tours we do. Each member of our staff has lived and worked in Cuba's travel industry for 10 years minimun. We do Cuba and only Cuba. All our tours include the best accommodations, luxury vehicles with private driver, most meals, access to all educational and cultural activities, and a professional tour guide, who is responsible for ensuring first class service during your educational and cultural learning experience. Worth mentioning too are the private receptions and exchange with renowned Cuban artists at their studios and personal residences. As a participant of our Cuba cultural tours, you will have a unique opportunity to also buy Cuban art first hand, directly from the artists! Authentic Cuba Travel assistant guides, art curators and tour directors will help you with export paper work and other hassles when needed. Authentic Cuba Travel escorted cultural tours provide a unique opportunity to visit UNESCO World Heritage sites, considered as the best preserved Spanish historical cores in The Americas, you will visit Old Havana and Camaguey Historical Center, Cienfuegos and Trinidad Historical Cores, among others. All tours are fully escorted by Cuban highly trained university graduated tour guides. Authentic Cuba Travel escorted cultural tours provide a unique opportunity to visit the most pristine natural sites of this tropical paradise, from UNESCO Biosphere Reserves and National Parks to Protected Areas, and witness the great biodiversity of the largest and most unspoiled island in the Greater Antilles. Understanding that travel plans change and sometimes need to be delayed, we’ve established the Lifetime Transferable Deposit option, designed to ensure that if you need to cancel or delay a trip, you’ll be able to find another time to take your next, great life-changing educational or cultural tour to Cuba. Lifetime Deposits offers any of our tour participants forced to delay a departure to retain their initial deposit for use at a later date at no extra charge—and with no questions asked. The Lifetime Deposit policy allows you to save your initial deposit (one per person, per confirmed tour) for an unlimited time, be it 10 weeks or 10 years. Put simply, we want to do the right thing by our travellers and ensure you can still take another trip if your plans have to change. Please, do notice that if you cancel your participation within 20 days of tour departure you lose 50% of your ground tour payment. If you cancel your participation within 10 days of tour departure you lose 100% of your ground tour payment. Please refer to our Terms and Conditions for further details. We also realize that your travel preferences can change over time, so your Lifetime Deposit can be used on any future tour and is not limited to the original tour you booked. Use your Lifetime Deposit to select the dream trip that suits your interests when you plan your next cultural and educational experience with us. Under this policy, Lifetime Deposits are also transferable. That means you can transfer your initial deposit to another traveller of your choice at no additional charge! Applies to the “deposit” value of your payment only. All other payments and final payment amounts subject to Terms and Conditions. Not redeemable with any other offer, discount or promotion. Each one of us, from directors to tour leaders, speakers, guides and representatives in Canada and Cuba has lived and worked in the Cuba travel industry for a minimun of 10 years. Nobody knows Cuba as we do! Call us and you will find sales representatives that are fluent in English and Spanish and who have lived and worked in Cuba Travel Industry for over 10 years minimun. Guarantee! Authentic Cuba Travel knows that safety always comes first. From performing rigorous safety checks, to providing constant on-tour safety expertise and immediate on-site assistance through our Cuba staff, our dedication to your safety is our top priority. Our Cuba operation experienced staff visits each and every hotel, restaurant, and site to ensure they meet our safety and security guidelines. We won’t book you in 4 or 5 bed share dormitories, like other companies do to reduce costs, but in clean, comfortable and safe double/ single rooms at the best hotels and resorts available in the area we visit. Most important, the hotels we work with are used to and happy to receive our tour participants. The hotel staff provides a level of attention, quality of service and friendliness to our foreign visitors that are unparallel in the Cuba travel industry. Authentic Cuba Travel has partnered exclusively with the best Cuba transportation company in Cuba: Transgaviota that operates the largest, newest, safest and most advance fleet in Cuba. We only provide luxury air conditioning motor coaches with the most experience drivers for our school Cuba education tours. An expert Authentic Cuba Travel Cuban guide and bus driver will be with your group every step of the way, providing constant and immediate guidance. They have been fully trained to handle any safety situations that may arise. Authentic Cuba Travel educational and cultural tours are fully customizable to meet the needs of your your organization, private group or business around any interest or theme. We also help groups organize events, festivals and conferences in Cuba. We facilitate 100% of your travel, accommodation and itinerary arrangements from departure to return. We make certain your Cuba experience is rewarding, safe and memorable. Our expert staff in Canada and Cuba guarantee quick seamless coordination. Minimum group size is ten (10) travelers, unless you are willing to pay a lot of money! There is no upper limit on group size. Cost drops dramatically with larger groups. Our escorted Cuba cultural tours are the result of the direct involvement of Cuban cultural institutions and organizations, universities and colleges, local tour companies, Cuban personalities, small communities and other hosts in the design and operation of our cultural programs. In return, most Authentic Cuba Travel's revenues remain in the pocktes of all these actors that made all and each tour possible. We are forever grateful to all those that made our programs the best experience ever for our tour participants! Authentic Cuba Travel's cultural tours are hosted by Cuba’s key Culture ministries, organizing committees and Cuban culture personalities. Travel with the peace of mind of knowing you are in the best hands! Cuba cultural tour participants are provided with “All Access” pass to attend all venues of Cuban cultural international events. Guided tour of the Experimental Printing Workshop, a cultural cooperative of young Cuban artists. Tour the Wifredo Lam Center, a cultural institution devoted to the study and promotion of contemporary visual arts in developing countries. 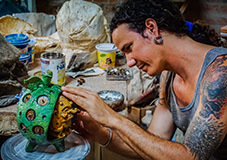 Private visits to the studios of Cuban contemporary artists such as Jose Fuster, Alicia Leal, Juan Moreira, Rene Pena and others prominent artists are part of Authentic Cuba Travel’s cultural tours. Travel to UNESCO World Heritage cities such as Old Havana, Vinales, Cienfuegos Historical Center, Colonial Trinidad, Santiago de Cuba, and other Cuban cities. Guided tour of the Museum of Fine Arts' Cuban Collection, one of the most important cultural institutions in Cuba, where we see the evolution of Cuba's visual arts over the last 300 years. Exchange with Cuban and international musicians, exhibitors, publishers and culture personalities. Visit to Callejon de Hamel. An alleyway street where an effort of cultural rescue led by fine artist Salvador González has been underway since 1990. Participate in the most traditional and popular cultural ceremonies in Cuba such as The Fire of the Cannon of 9 O’Clock.